Home » The Step Short Arch Centenary Commemoration of the Armistice, 22nd July, 2018. 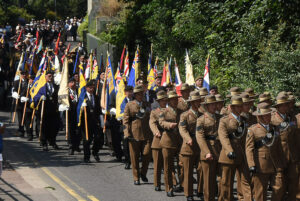 The Step Short Arch Centenary Commemoration of the Armistice, 22nd July, 2018. 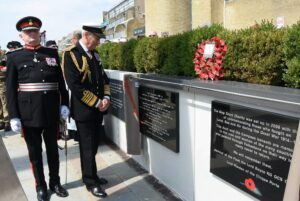 The Lord-Lieutenant of Kent with The Lord Warden of The Cinque Ports Admiral of The Fleet The Lord Boyce at the plaque unveiling ceremony. (c) Barry Duffield DL. 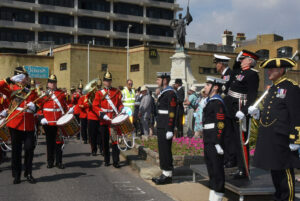 The Lord-Lieutenant of Kent, Viscount De L’Isle MBE took the salute during the service held at The Step Short Arch on Lees Cliff Road, Folkestone on 22nd July. The Lord Warden of The Cinque Ports Admiral of The Fleet The Lord Boyce KG GCB OBE DL made an address, before unveiling two plaques marking the event. The Lord Lieutenant of Kent Viscount De L’ Isle, taking the Salute. Leading the Parade is the Regimental Band of the Princess of Wales’s Royal Regiment. (c) Barry Duffield DL. The Parade then marched down the Road of Remembrance to the Harbour Arm from where many millions of soldiers crossed to the Western Front during the First World War. A number of soldiers never returned and were buried in the military war graves in France, of those who returned a number had suffered life-changing injuries in body or mind. There can be few Kentish families who did not lose at least one member of their number. The Parade marching down Step Short Hill. (c) Barry Duffield DL.